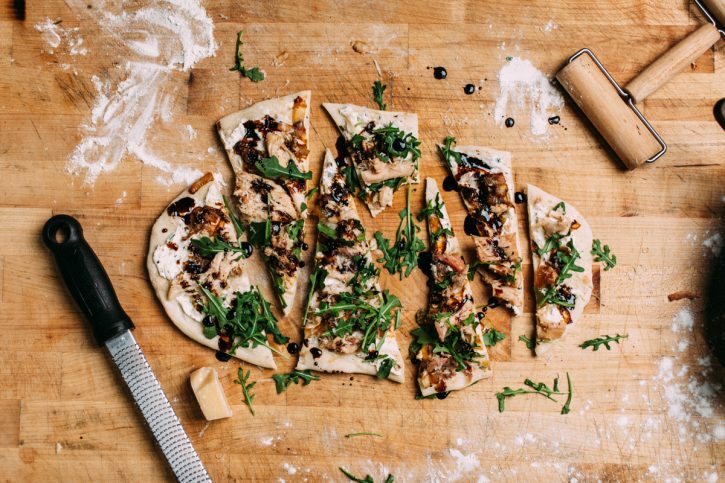 We’re taking components and techniques from a couple of recipes you may have come across here on The Sauce to make a wonderful grilled flatbread. 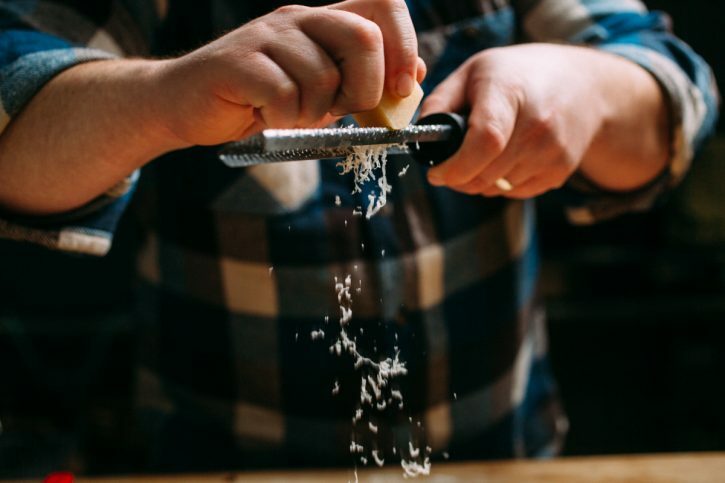 The dough is the same dough we use in our pizzas, and the spatchcock chicken is a technique utilized often in our kitchen. Combine those things with a delicious cream cheese spread, caramelized onions, some greens and a sweet and tangy apple balsamic reduction and you have a winning main dish or appetizer! Simple savory flavors with creamy cream cheese that melts right into the warm fresh grilled flatbread. 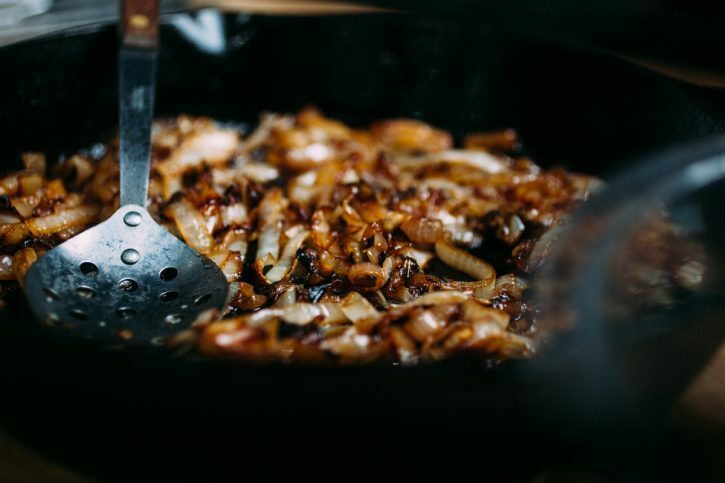 Sweet and salty caramelized onions. 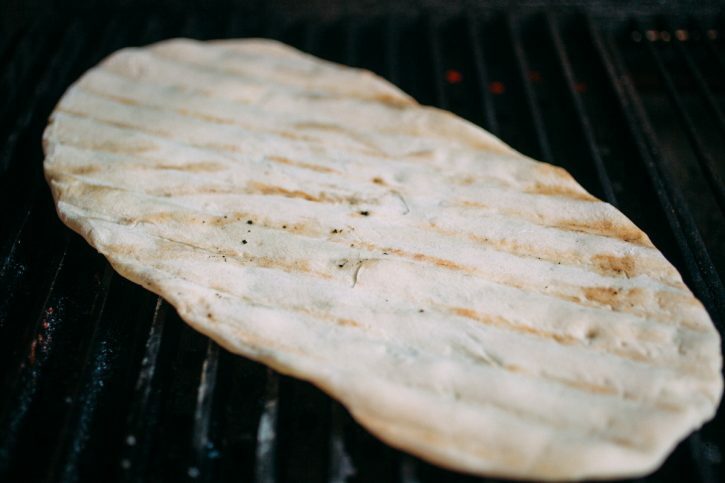 You might think it sticks to the grill, but the dough cooks up perfect on the GrillGrates! Combine the pizza ingredients in a stand mixer. Mix on medium-low with the dough hook attachment until a ball is formed (about 1 minute), then set a timer for 8 minutes and continue mixing. At 8 minutes, remove the dough from the bowl and place in an oiled bowl covered with oiled plastic wrap. Allow to rise at room temperature until doubled in size. Turn the dough out onto a floured work surface and divide into three equal portions. Roll each portion into a ball. Place on an oiled pan. Cover with oiled plastic wrap and transfer to the fridge for at least 30 minutes. To make the balsamic reduction, combine the ingredients and bring to a boil in a pan. Stir occasionally to prevent scorching. You’ll notice the bubbles get much larger as the liquid thickens. Reduce down to 1/4 cup. Preheat your Yoder Smokers YS640 pellet grill to 275ºF. Season the spatchcocked bird under and on top of the skin with Cattleman’s Grill California Tri-tip Seasoning. Place skin side up on a foiled sheet pan. Smoke on the second shelf until the internal temperature in the breasts reaches 160ºF. Remove from the grill. Pull the meat from the bones and shred. Strain the juices from the bottom of the pan and incorporate into the shredded meat. Increase the temperature of your grill to 400ºF. In a Lodge Logic 12” cast iron skillet. Melt the butter over medium-low heat. Add the sliced onions and a pinch of salt. Allow to slowly cook down and caramelize, stirring occasionally, until softened and browned. 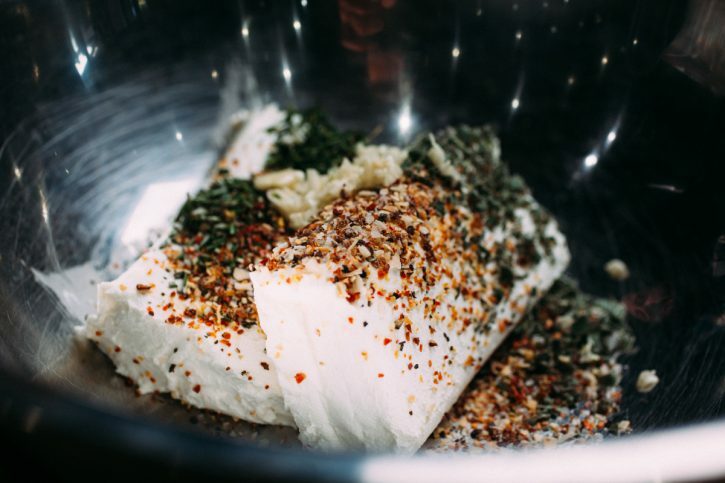 Combine the room temperature cream cheese, minced fresh herbs, minced garlic and 1 tbsp Cattleman’s Grill California Tri-tip Seasoning in a mixing bowl. Using a spatula mix well to combine. Stretch or roll out a dough ball into an oblong shape. Place directly on the oiled grates, on the grill. Grill until the dough releases and has a little color. Flip and grill until cooked through. 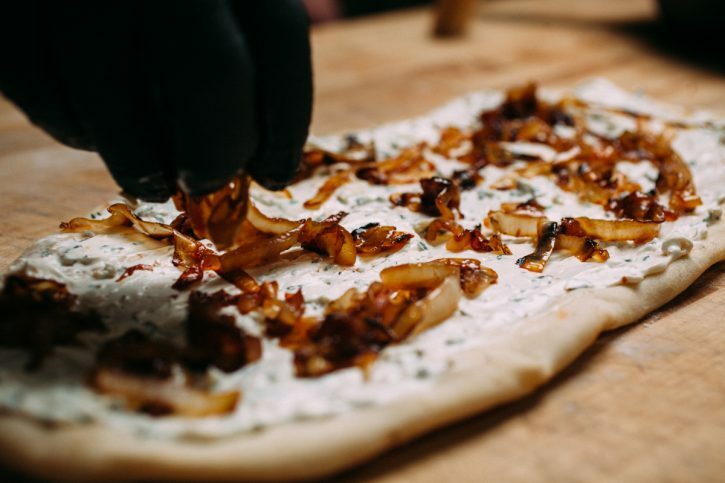 Remove from the grill and immediately top with the cream cheese mixture, shredded smoked chicken and caramelized onion. Optionally, top with baby arugula. Slice and serve.